Recently, in the case of Kologenski v. Genuine Parts Corporation (1622-CC00427), Judge Sengheiser denied Genuine Parts Company’s (GPC’s) Motion to Dismiss for Lack of Personal Jurisdiction, finding that GPC consented to personal jurisdiction in Missouri by maintaining a registered agent to accept service of process in Missouri. This outcome is consistent among St. Louis City judges, as Judge David Dowd and Judge Joan Moriarty have recently ruled the same way on similar motions to dismiss for lack of personal jurisdiction. Since the United States Supreme Court decided the case of Daimler AG v. Bauman, 134 S. Ct. 746 (2014), personal jurisdiction for corporations has become a fiercely contested issue. In Daimler, the Supreme Court determined the forum court did not have personal jurisdiction over the defendant because the conduct in question did not occur in the state. Further, the Supreme Court reasoned the defendant’s slim contacts with the state, relative to its other national and international contacts, were not sufficient to render it “at home” in the state for the purpose of personal jurisdiction. The application of the Daimler case and its due process analysis give rise to GPC’s Motion to Dismiss in the Kologenski case. In Kologenski, Plaintiff James Kologenski was diagnosed with mesothelioma in January 2016 and filed his personal injury lawsuit in the Circuit Court of St. Louis City, Missouri alleging exposure to asbestos and asbestos containing products through his occupational work as a mechanic and truck driver from 1957 through 1990. The Kologenski lawsuit was originally assigned to Judge Julian Bush one of the sitting “motion” judges in St. Louis City and Plaintiff’s change of judge transferred the case to Judge Joan Moriarty, the other sitting “motion” judge in St. Louis City. However, soon after the case was transferred to Judge Moriarty, GPC’s change of judge transferred the case to Judge Sengheiser. Since Judge Sengheiser is not one of the sitting “motion” judges in St. Louis City, GPC hoped for a favorable result on its Motion to Dismiss for Lack of Personal Jurisdiction. The following will summarize the oral arguments for and against GPC’s Motion to Dismiss and Judge Sengheiser’s ruling. *It should be noted both parties filed several briefs in support of their arguments, which Judge Sengheiser read in their entirety, and the oral arguments served only to supplement the written briefs. The content of the parties written briefs are not analyzed. GPC heavily relies on Daimler AG v. Bauman, 134 S.Ct. 746 (2014) and Goodyear Dunlop Tires Operations, S.A. v. Brown, 131 S. Ct. 2846 (2011). According to Daimler, “a court may assert jurisdiction over a foreign corporation to hear any and all claims against [it] only when the corporation’s affiliations with the State in which suit is brought are so constant and persuasive as to render [it] essentially ‘at home’ in the forum State.” Diamler, 134 S. Ct. at 751. 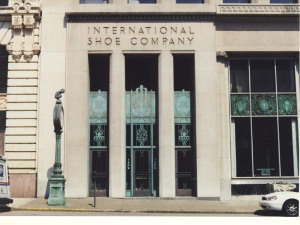 GPC also argued that in the well-known holding of International Shoe Company v. State of Washington, Office of Unemployment Comp. & Placement, 326 U.S. 310, 316 (1945) (“due process requires minimum contacts with the territory of the forum only where the defendant is not “present” in the forum, or where it has not consented to jurisdiction in the forum”), the word “consent” is a broad, loaded word, and needs to be explicit. Having a registered agent should not constitute a corporation’s consent to all-purpose jurisdiction. Since Daimler states a Defendant must be “at home” in the state in order to be sued in the state, GPC argued there is simply not enough sufficient contacts to say GPC is “at home” in Missouri. GPC maintains Plaintiff argues a “some equals all” approach, such that if an entity transacts some business in the state, all litigation concerning that entity can occur in that state. GPC contends this is improper logic because a registered agent does not constitute consent to all-purpose jurisdiction. Further, GPC addresses the recent St. Louis City Orders issued by Judge Moriarty and Judge Dowd, which ruled a registered agent is enough for personal jurisdiction, and contends they rely on cases that were decided well before Daimler. Judge Sengheiser interrupts GPC’s argument and inquires as to the purpose of a registered agent. GPC responds that the registered agent is there to accept service if a cause of action arose in that state and the defendant can be sued there. In support of their position, GPC points out that the Plaintiff did not purposefully avail himself in Missouri because he never lived in Missouri and did not buy a GPC product in Missouri, so this cause of action did not arise out of any transactions or occurrences in Missouri. Plaintiff’s argument rests solely on the principal that having a registered agent in Missouri constitutes consent for purposes of personal jurisdiction. Plaintiff distinguishes Daimler from the current Kologenskicase and argues Daimler does not address the issue of consent; rather, Daimler deals with the question of specific and general jurisdiction when there is no consent. Three St. Louis City judges, Judge Dowd, Judge Moriarty, and most recently Judge Ohmer, have ruled on this issue and all have found that having a registered agent constitutes consent. Plaintiff indicates his position is as simple as the Missouri registered agent statute, which states a foreign corporation with a registered agent “has the same duties, restrictions, penalties, and liabilities now or later imposed on, a domestic corporation of like character.” R.S.Mo. §351.582(2)(2012). Further, Plaintiff points out that Delaware, a state where most corporations are incorporated, has a registered agent statute which does not contain this specific language. In further support, Plaintiff notes there has yet to be a court decision stating a registered agent is not consent to personal jurisdiction. Plaintiff also argues GPC is subject to jurisdiction under Missouri’s long arm statute, R.S.Mo. §506.500 and read aloud portions of the statute which state a defendant is subject to jurisdiction in Missouri if it transacts any business within the state or commits a tortious act within the state. In the alternative, Plaintiff argues that if Judge Sengheiser should determine GPC has not consented to personal jurisdiction, then he should find that GPC is “at home” in Missouri. GPC has been transacting business in Missouri for nearly 30 years and employs 500 employees in the state. During initial discovery, GPC produced an affidavit which stated GPC’s business in Missouri only constitutes 1.7% of its total business nationwide. However, Plaintiff argues that this 1.7% totals billions of dollars. Additionally, Plaintiff alleges that GPC is in fact doing business in Missouri because GPC has filed suit many times in Missouri against other entities and even sought a writ to the Missouri Appellate and Supreme Courts. Plaintiff makes a public policy argument and argues if personal jurisdiction is denied for GPC, then Plaintiff would have to file an individual lawsuit against every other defendant in this case in many different states. GPC notes that Plaintiff left out important language in the Missouri long arm statute when it was read aloud for the record. Missouri’s long arm statute also includes the words “arising from.” R.S.Mo §506.500 sets forth, a defendant is subject to the jurisdiction of Missouri courts “as to any cause of action arising from the doing of any of such acts: (1) the transaction of any business within this state…” GPC stresses the “arising from” language is important because other states’ long arm statutes say “related to,” but Missouri does not use that particular language. GPC maintains the present litigation does not “arise out of” the 1.7% of its business conducted in Missouri. GPC argues that a registered agent’s authority is to accept papers on behalf of a corporation, but this authority is not granted in all 50 states. For instance, a registered agent in Missouri does not have authority to consent to personal jurisdiction on behalf of the corporation if the suit should have been filed in Arizona. GPC concludes that doing business for 30 years in Missouri does not give all-purpose jurisdiction to lawsuits that do not arise out of transactions in Missouri. Plaintiff concludes by stating GPC’s role in the Kologenski case is not “simply driving through the state” because GPC is still currently registered in Missouri. GPC is not required to do business here, but it elected to be registered in Missouri and subjected itself to the laws of the state. Plaintiff finally states the basis of the current case is that Mr. Kologenski was exposed to asbestos while performing brake work during the time he attended school in Missouri. Judge Sengheiser analyzed whether there was personal jurisdiction over GPC under Daimler, but went on to say that Plaintiff need not show that GPC had minimum contacts with or is “at home” in Missouri in order to bring a lawsuit against GPC. According to Int’l Shoe Co. v. State of Wash., Office of Unemployment Comp. & Placement, 326 U.S. 310, 316, (1945), due process requires minimum contacts with the territory of the forum only where the defendant is not “present” in the forum, or where it has not consented to jurisdiction in the forum. Judge Sengheiser relied on State ex rel. K-Mart Corp. v. Hollinger, 986 S.W. 2d 165, 167 (Mo. banc 1999), which states “a corporation has long been considered “present” within the state when its agent is served with process in the state.” Judge Senheiser agreed with this conclusion despite noting that in State ex rel. K-Mart, K-Mart conceded its contacts in Missouri were sufficient to satisfy due process requirements, and thus, the K-Mart court did not address the issue of whether registration of a foreign corporation and designation of an agent for service of process, without more, is always sufficient to confer jurisdiction. Despite GPC’s arguments, Judge Sengheiser determined Daimler did not affect the long-standing rule that a defendant is present or has consented to jurisdiction through the appointment of a registered agent in the state. Judge Sengheiser concluded that since GPC maintains a registered agent in Missouri and was served through its registered agent, GPC is considered present in Missouri. Judges in St. Louis City continue to rely on the K-Mart decision and find personal jurisdiction based upon the existence of a registered agent to accept service in Missouri, despite the fact that the K-Mart Court did not consider whether a registered agent always confers personal jurisdiction upon a corporation. The issue of personal jurisdiction in Missouri continues to be disputed in both asbestos and non-asbestos cases. To date, the St. Louis City Circuit Court has several pending motions to dismiss for lack of personal jurisdiction waiting to be heard. Later this month, the Missouri Supreme Court will hear arguments on this same issue. The content of this blog is intended for informational purposes only, and is not intended to solicit business or to provide legal advice. Since the laws of different states vary, the information on this blog may not apply to every reader. You should not make, or refrain from making, any legal action based upon the information contained on this blog without first seeking professional counsel. Your use of the blog does not create an attorney-client relationship between you and Pitzer Snodgrass, PC, or the authors. The choice of a lawyer is an important decision and should not be based solely on advertising.